We offer a wide range of Sanitary Napkin Disposal Receptacles to our valued clients. These Sanitary Napkin Disposal Receptacles allow for safe disposal of Napkins. Attractive design: stainless-steel exterior and aesthetic design make this trash receptacle an attractive addition to offices, schools, malls, campuses and more. 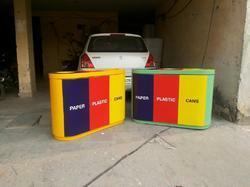 We are engaged in offering an extensive range of Waste Receptacles in the industry. These Waste Receptacles that we offer are highly used in hospitals and clinic for throwing wastes in them. These Waste Receptacles are easily available in various dimensions at pocket friendly range. Waste Receptacle— 18-8 S, type-304, 20-gauge (1.0mm) stainless steel. 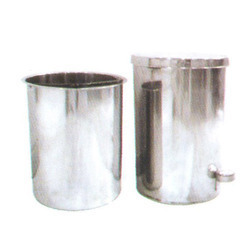 Waste Receptacle— 18-8 S, type-304, 20-gauge (1.0mm) stainless steel. All-welded construction. Exposed surfaces have satin finish.